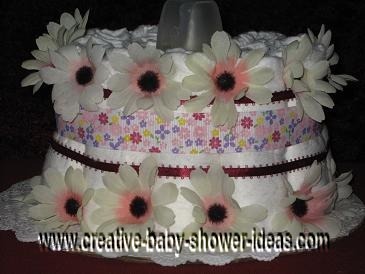 Our Daisy Flower diaper cakes gallery is full of creative and useful ideas to help you with your next diaper cake project. Each cake in our picture gallery are posted to inspire you to make a fabulous cake! This is a cake that I helped my friend to make. This was our very first endeavor and it came out so much nicer than either of us would have thought. How rewarding! We used a 140-pack of size 3 diapers from Costco. We used small hair bands to roll each diaper individually. The bonus is mom can reuse the hair bands later for her little girl! Larger rubber bands held each layer together. 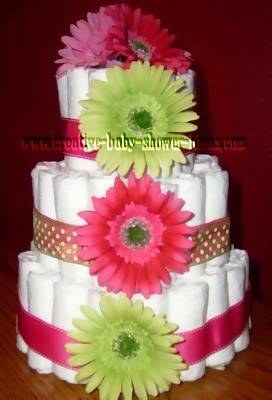 We fell short of about 10 diapers to give the bottom layer of this cake the correct tiered look so we ended up rolling towels to hide in the middle of the cake to give it some bulk. We used a cardboard mailing tube to connect all the layers and it was super stable. The mom-to-be had a lavender theme in the nursery so most of the decor was in lavender. We made the cake a sunny yellow to give some contrast. We wanted this to look as much like a real cake as possible so we kept it simple. We wrapped each layer with coordinating yellow ribbon. And we finished it off with one bouquet of spring flowers on top and a sprinkle of daisies along the tiers. It was the hit of the party! This cake was made in 3 layers using approximately 75 newborn diapers that I were laid sideways, folded, just as they came from the package. The trick is to put them together in a swirl pattern, not just straight out from the center. I used giant rubber bands to hold them together until I could tie them with the ribbons. I then placed the largest layer on a large deli platter and tucked the gathered lace under it. I put a short piece of wooden dowel rod through the center of the diapers and then placed the other layers on top of each other over the dowel rod for support. The ribbons were just hot glued in the back and the gerber daisies were just stuck in between the folded diapers. The little angel dolls were found at a discount store after Valentine's day--they actually had bows and arrows as in cupids. I double-taped their wings to the diapers themselves for support. I attached the ribbon to the little heart pillow that I had found and wire-picked it into the top layers. 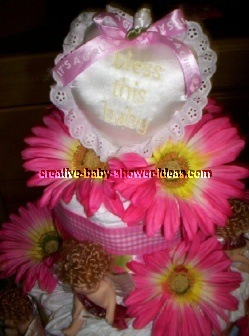 The other baby items were laid on the cake after set up for the shower. This is a cake that I made for my best friend. 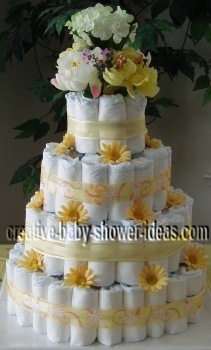 I followed the basic diaper cake method, rolling diapers and wash cloths into little rolls, and placing them around baby bottles to make the layers, and tucked small items in betweeen the rolls. I then wrapped fleece blankets around them, tucking in the loose ends to secure. 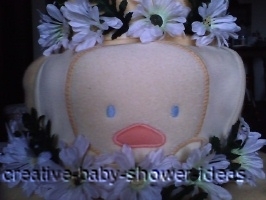 I wrapped ribbon around each layer, and hot glued daisies to the ribbon, and tucked daisies and a small stuffed duck into the top to cover up the uncovered portion, and put a duck bib in the front. 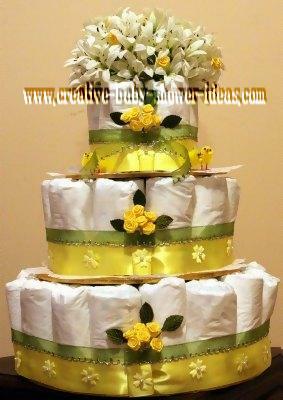 I made this diaper cake out of 75 size 2 Huggies Supreme diapers. They have the cutest design, both on the front and the back. I rolled them into three tiers using a paper towel roll for the middle support and a 16" cake base at the bottom. I used baby items such as baby socks, wash clothes, pacifiers, and spoons for decoration. 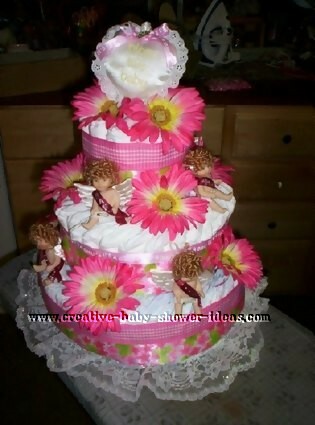 Tied ribbon around each tier and around the decorations and topped it with artificial Gerber Daisies. If you would rather use live flowers, find a tall thin vase for your middle support. 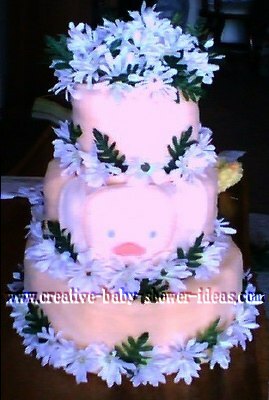 Can make baby diaper cakes for local baby showers in Dallas/Fort Worth, please call for a quote 817-358-0935. 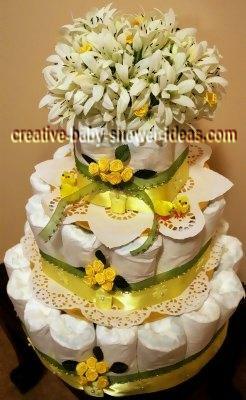 This daisy diaper cake was made with 15 sized 2 diapers and a 5 oz bottle. This was fun to make! 1 packet of Newborn Huggies diapers (1 packet had 54 diapers). 3 golden colored cake bases of different sizes. A broad yellow satin ribbon and some dressy green net ribbon. A packet of yellow silk flowers and pearl pins. A packet of Easter birds. A bunch of artificial white flowers for the top tier. RECIPE: I rolled each diaper individually in tissue paper to make sure they are hygienic to use and remain dust proof. After that started to arrange the diapers on the bases and secured them with a ribbon. The bottom 2 tiers were easily arranged. For the top most tier I used a toilet paper roll and glued it to the center of the base. I arranged the diapers around it. Once done I arranged the cake tiers one on top the other. I cut the stems and inserted the white flowers on the top tier through the hole in the toilet paper roll and tied the yellow and green ribbons around the tiers. Then I used the bright yellow flowers and leaves and arranged them on the point where I glued the ribbons. I stuck to birds on the top tier. To make the yellow ribbon dressier I used yellow flowers and pearl pins and stuck them equal distant from each other. This cake is for my Sister in Law's Baby Shower. She is expecting her first child in Feb and we're all very excited to welcome the newest addition to our lovely family! This is my second diaper cake I’ve made. The first was for “It’s a Boy” jungle theme, so I had a little leg up on making this one. I think it turned out very well. Also, it was made with love! I followed a pink and purple theme with butterfly, flowers and girly theme. 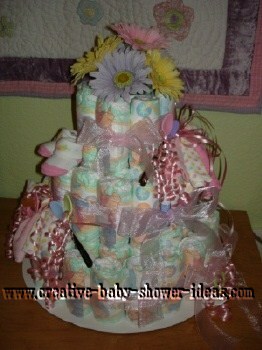 I used 50 diapers in my diaper cake. It made 3 layers. 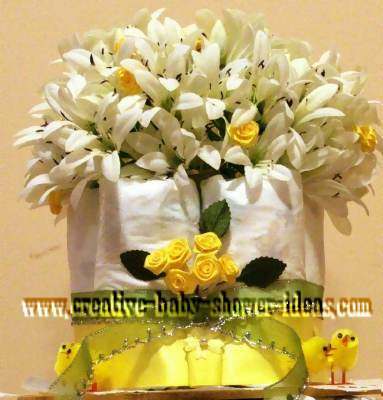 In this diaper cake, I used 50 diapers, 1 medium baby bottle bank, wrapping mesh, colored tissue paper, ribbons, bow, Easter grass/shredded paper, pins, fabric glue, hot glue and much more…..:) I enjoyed making it very much!